A few weeks ago I described how we reattached the wing on Boo-Qwilla. Although it’s great that we were able to reattach the wing, we don’t want to do it again! Two preventive measures we took include applying a borate solution and attaching lead flashing. This post deals with the application of a borate salt preservative to the totem and the next will describe the process of designing and attaching protective lead flashing. As you might remember from my previous post, before the wing was reattached, the mortise joint was saturated with Bora-Care—a borate-based wood preservative—in order to prevent future infestations by fungi and pests. The next step was applying this treatment to the entire totem. 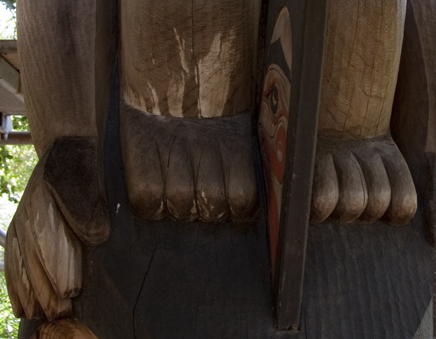 Considering Boo-Qwilla is about 40 inches in diameter and about 25 feet tall, the scale alone of this application was beyond typical usage. Other factors that we had to consider were the delicacy of the paint and the potential change in color to the wood itself due to the Bora-Care. We consulted with a distributor to ensure we were anticipating everything we could. They assured us that the product wouldn’t change the color of the wood or disturb the paint. Some whitish crystals – possibly remnants of a waterproofing agent applied by the artist – did form on some surfaces, however they brushed off fairly easily. Bora-Care is a highly viscous substance – similar to honey – and you dilute it with water prior to application. The active ingredient – disodium tetraborate – is suspended in a glycol syrup in order to aid penetration into the wood. The glycol takes a long time to penetrate and to dry; the distributor recommended 48 hours without rain to ensure maximum penetration. We waited for a weather forecast of clear skies and went to work early. About two and a half gallons of undiluted Bora-Care were applied to Boo-Qwilla—the same amount you would apply to 2,000 board feet of lumber! The application of Bora-Care was relatively straightforward; we combined it with warm water to form a one-to-one solution and then brushed it on. It took us all day—about nine hours—to apply the calculated amount of solution. The major obstacle was simply getting the wood to quickly soak up the Bora-Care; once you saturate a surface you have to wait for it to dry before reapplying. The large end-grain surfaces absorbed the most and some checks in the totem acted like conduits for the Bora-Care to penetrate further. After about a week, the end grain surfaces were completely dried out and the wood regained its original color. Considering Bora-Care has a tested effective lifespan of about 12 years, we won’t definitively know how effective the treatment was for some time. 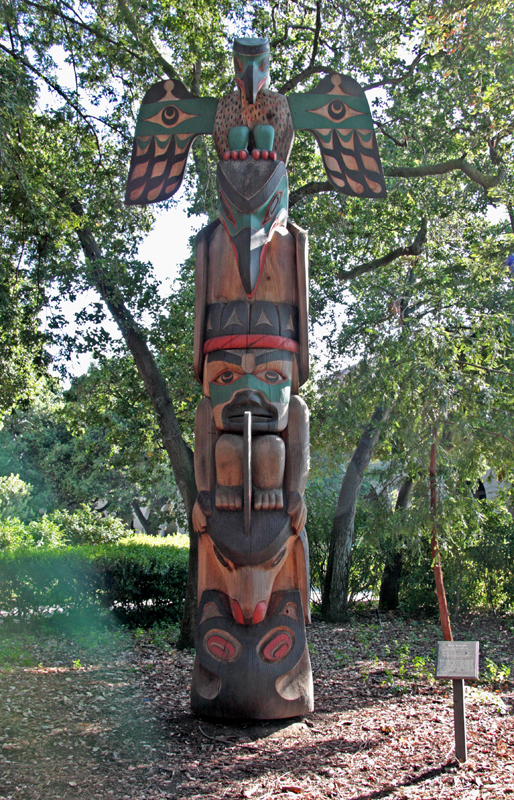 The ultimate test is simply going to be how long the totem keeps its character and appearance. However, Boo-Qwilla looks great and everyone feels better knowing that the pole will be protected in the future having undergone an overall, preventive treatment.